Congratulations to Dr. Minh Nguyen on the publication of his first book, New Essays in Japanese Aesthetics (526 pages), by Lexington Books, an imprint of Rowman & Littlefield. The result of six years of research and development, his wide-ranging interdisciplinary edited collection has elicited high praise from leading figures in Japanese Studies, including Donald Keene, widely considered the Western world’s most celebrated scholar of Japanese literature and culture. Joining EKU in 2003, Nguyen is currently Professor of Philosophy and Asian Studies, Director of the Interdisciplinary Asian Studies Program, Associate Director of the Honors Program, and Coordinator of National and International Scholarships and Fellowships. From 2010 to 2014, he served as Coordinator of the Chautauqua Lecture Series. 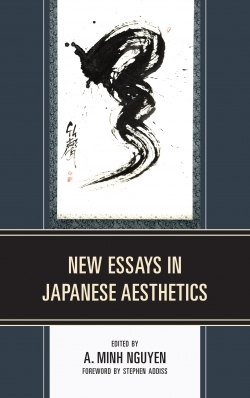 For more information, please visit https://www.amazon.com/Essays-Japanese-Aesthetics-Minh-Nguyen/dp/0739180819 and https://rowman.com/ISBN/9780739180822/New-Essays-in-Japanese-Aesthetics. For a special 30% discount offer, see the attached flyer at the bottom of this announcement. This collection presents twenty-seven new essays in Japanese aesthetics by leading experts in the field. Beginning with an extended foreword by renowned scholar and artist Stephen Addiss and a comprehensive introduction that surveys the history of Japanese aesthetics and the ways in which it is similar to and different from Western aesthetics, this groundbreaking work brings together a large variety of disciplinary perspectives—including those of philosophy, literature, and cultural politics—to shed light on the artistic and aesthetic traditions of Japan and the central themes in Japanese art and aesthetics. Contributors explore topics from the philosophical groundings for Japanese aesthetics and the Japanese aesthetics of imperfection and insufficiency to the Japanese love of and respect for nature and the paradoxical ability of Japanese art and culture to absorb enormous amounts of foreign influence and yet maintain its own unique identity. Intended to advance scholarship in multiple areas of inquiry and to serve as a valuable resource for the classroom, New Essays in Japanese Aesthetics will appeal not only to a wide range of humanities scholars but also to graduate and undergraduate students of Japanese aesthetics, art, philosophy, literature, culture, and civilization. Masterfully articulating the contributors’ Japanese-aesthetical concerns and their application to Japanese arts (including literature, theater, film, drawing, painting, calligraphy, ceramics, crafts, music, fashion, comics, cooking, packaging, gardening, landscape architecture, flower arrangement, the martial arts, and the tea ceremony), these engaging and penetrating essays will also appeal to nonacademic professionals and general audiences. This seminal work will be essential reading for anyone interested in gaining a deeper understanding of Japanese aesthetics.